Today more than ever, brands are trying to connect with their customers through online channels such as the social media, public forums, hosting online discussions and surveys. According to a study conducted by MarketingCharts, there is an almost 50% increase in digital marketing budgets of various companies today compared to the same in 2016. This fact points us to the increase in demands of customers to be able to consume information and content from online channels and place their decisions on the basis of what they find there. Organizations have realized that better content can increase the traffic driving to a blog post by about 2,000%. Thus, content marketing and content creation are being considered the most crucial facets of online marketing today. Besides this, Google has retained, very deservingly, the top spot of the search engine game. The search engine giant is responsible for a whopping 94% of total organic traffic to websites on the internet and drives about 96 percent of smartphone search traffic. Search engine today is analogous to Google. Today, no marketing strategy is complete without a laid-out plan for digital marketing, and it would be ignorant to say that marketing will ever work without going online. 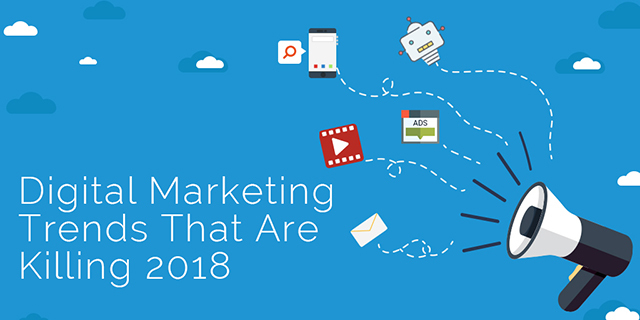 Here are some additional digital marketing trends for the year 2018. Latest stats reveal that video content is 50 times more probable to drive organic search engine results than plain text content. Also, about 64% of online shoppers revealed that a video on the social media was the reason behind their buying choice. With such great traction, videos, when leveraged in the right manner, can bring fortunes of sales and marketing results to any brand. One of the key things to keep in mind while creating videos for your brand is to keep the voice authentic. Any video that you create, whether or not it features a human face, it should stand true to the voice of the brand and appear cohesive to the text content. According to Gartner, this year, about 20 percent of the content will be generated by machines. Bots are not the clunky non-human machine programs that we perceive them to be. Instead, bots can create compelling stories for a brand and help build a content strategy that is quick and seamless. When bots are able to build content that is relatable and genuine, brands will be able to interact quickly with their audiences on multiple platforms. Recently, Facebook reported that a total of 100,000 active bots work on the social media platform. Chatbots are becoming content creators that will allow companies to leverage data analytics and research to create content that is trending and attracting readers and viewers all over the internet. Twitter is one social media platform that failed to gain users in 2017 according to this report. While LinkedIn has a total of 106 million active users, the number is bound to rise as there have been significant changes to the platform to improve the advertising aspects. The platform also provides better opportunities for B2B and B2C businesses to expand their team, reach out to potential customers, and build a brand. LinkedIn is a platform that originally marketed itself as a professional networking space for individuals and brands. Today, the platform has evolved into a holistic social media where readers and viewers derive value. This year, brands and businesses will need to cater to LinkedIn as part of their digital marketing strategy as the channel has too much potential to be ignored. According to latest statistics, 78% of digital marketers believe that the industry is headed towards customized content. For creating customized content and custom experiences for buyers, it is important to leverage technologies like data and analytics, Artificial Intelligence (AI), Machine Learning (ML), etc. Marketing platforms already collect user-specific data such as browsing history, search history, search and click patterns, etc., so that any consumer’s behavior can be mapped and used later for personalized recommendations and content. In a study, 40% of mobile users revealed they would increase their spending limit with a brand if they receive personalized coupons from them. The personalization frenzy is here to stay and E-commerce businesses, in particular, need to identify the areas within their company where personalization would benefit their marketing efforts. Brand influencers will come out as a challenge to businesses as more and more marketers focus on gaining traction from influencer marketing. In a recent study, 70% of teenage subscribers of YouTube said they trusted influencers more than celebrities. Long story short, businesses are striving to gain the spot of influencer marketing as the trend is flourishing increasingly. Companies from mid-sized to large organizations are reaching out to influencers across domains and industries for their marketing needs. In a study where buyers were asked which sources they found credible to make a buying choice, 87% of B2B buyers said they trusted industry influencer content the most, followed by other participants who trusted peer reviews, user-generated feedback, and third-party publications. As influencer marketing grows by leaps and bounds, companies will be compelled to cater to this aspect of marketing this year. Ephemeral content is the one that stays on the face of the Earth for no more than 24 hours! Businesses revealed that they had a separate strategy for their ephemeral content and that it was quite different from their always-online content that is there forever. Instagram and Facebook are the social media marketing channels that have brought in the trend of stories that disappear after a day. A high-quality content strategy that focuses on ephemeral content can do only good for any business this year. About 250 million stories are created every day and businesses will have to look for ways to stay top-of-mind with their prospective buyers through their short-lived stories. As ephemeral content marketing grows in significance even more this year, brands will have a hard time ignoring the trend. No matter what goes and stays, the quality of content will be superior to all other trends, this year too! Companies will focus on creating an authentic brand voice and will strive to stick to their own principles and ethics, as a standout brand is what customers appreciate. According to a recent study by Sprout Social, about 86 percent of customers preferred an honest and authentic brand personality. When businesses try to replicate their competitors this year, they will be left behind. It is only advisable to keep on doing what you do best, consistently. Creating content that echoes in the minds of your customers would be job one for marketers this year, and putting it up on platforms that are leading the way this year, would be the next necessity. The only thing that falls after creating great content is checking if the content spurs engagement and interaction among the buyers or potential customers. About 45 percent of marketers considered their interactive content to be highly effective. Interactive content consists of quizzes, surveys, discussion threads, contests, or assessments, to name a few. With online marketing landscape being washed and repainted, companies will have to spur themselves in action to get to the new destination in time, or they will lose more than just time. 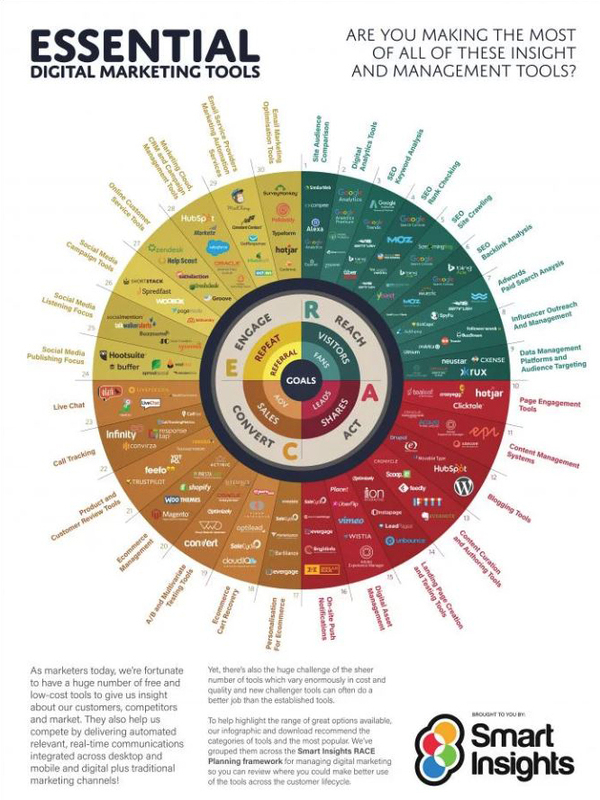 Analyzing all these digital marketing trends, at the end, it’s all about connecting with the consumer to keep the user experience and brand story both personal and effective. And don’t forget about big data analysis, apps and software development – might be the next big things in no time.